A torus (more precisely, a 2-torus) has the shape of the outer surface of a donut. A torus can be parametrized by two angular variables , each in . A dissected torus can be pictured as equivalent to a rectangle in the two-dimensional Euclidean plane , with opposite pairs of edges glued together. Locally, the 2-torus resembles , but there is no global continuous mapping since the Euclidean plane extends to infinity. 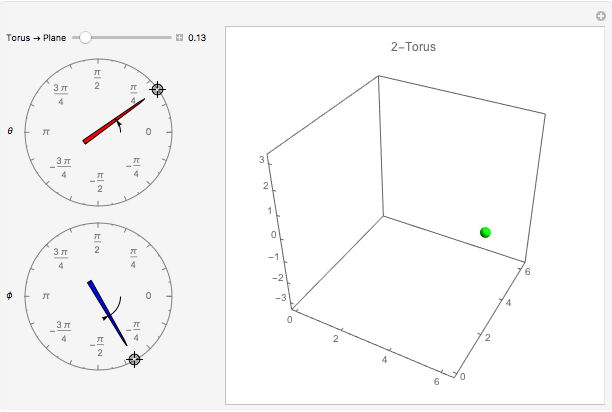 This Demonstration shows possible mappings from a 2-torus to . The operation necessarily introduces discontinuities, where small changes of or create large jumps in the planar configuration. Two rotary dials determine a point (highlighted in green) in the course of a transformation. 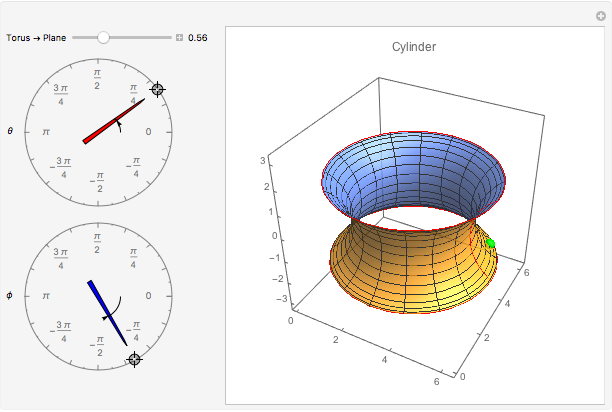 The 2-torus (or ) is a manifold that can be embedded in , as illustrated by the 3D plot. A manifold is a topological space that locally resembles -dimensional Euclidean space in a neighborhood of each point. Locally, the neighborhood of any point on resembles one in (the Euclidean plane). Globally, a manifold can differ from a Euclidean space; for example, the surface of the sphere is not topologically equivalent to a Euclidean space. Likewise the surface of a torus. As shown in this Demonstration, the torus can be split along its longest circumference to form a cylinder, and then this cylinder can be opened up into a rectangle. Both operations introduce discontinuities where small changes of or create large jumps in the configuration. In the context of manifolds, these mappings are called charts. To avoid discontinuities, you can switch from one chart to another, much like a pilot can switch from a map of North America to a map of the Pacific when flying from New York to Tokyo. A collection of overlapping charts is called an atlas. A fun problem: what is the minimum number of charts needed to construct a complete atlas of the torus? 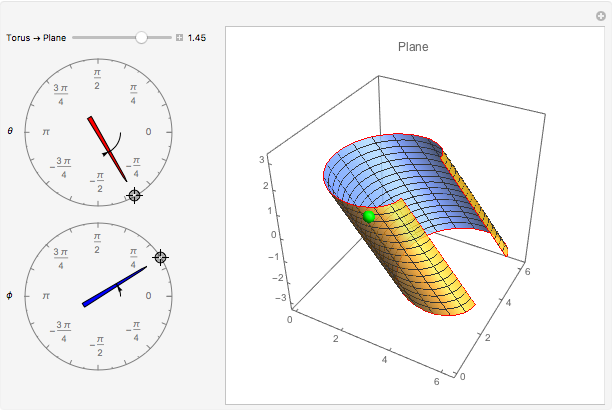 Aaron T. Becker and Haoran Zhao "Chart for a Torus"